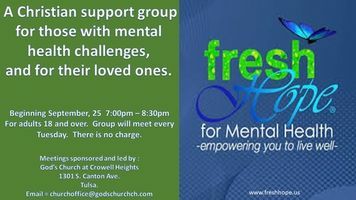 Fresh Hope This will be a weekly support group meeting on Tuesdays. People with OCD, PTSD, depression, anxiety and many other diagnosed illnesses will benefit from this mutual help, peer-to-peer support group. Police Officers, Fire Fighters and other public servants are welcome. This is a nondenominational group and we approach mental health recovery from a faith-filled perspective. This a safe and non-judgemental place for you to come. Text any questions you may have to churchoffice@godschurchch.com.